These tyvek wristbands from Goldistock are a great set of wristbands. They are made from the tyvek materials so they are waterproof, once you close them then can’t be reused so people can not take them off and put them on someone else. These are great for events. They are each numbered so you can keep track of how many you have handed out. They are adjustable so you can fit them to any wrist size so you can use them for kids and adults. Once you remove the label though and stick them, they can’t be reused so make sure to stick it where you want it. These are neon green, easy to spot in crowds. Great product. This a pack of 500 so you get a bunch of them! HIGH GRADE TYVEK MATERIAL. 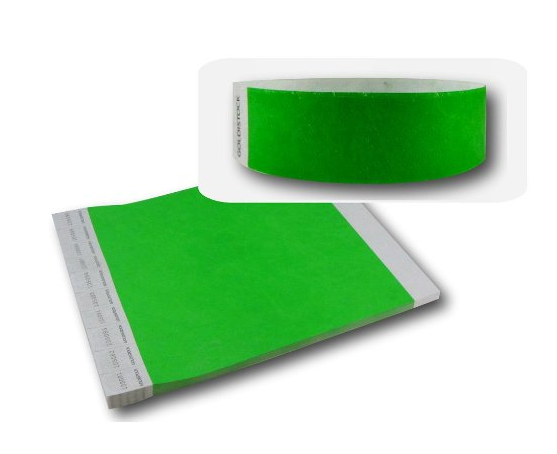 Goldistock wristbands are manufactured in the USA with genuine Dupont Tyvek material. 100% Waterproof and durable. Stays on even if it gets wet. Does not stretch or tear. IDEAL FOR ANY EVENT: Concerts, sporting events, parties, fairs, water & amusement parks, trade shows, conferences, school functions, seminars, and nightclubs. Perfect for any event. SAFE & SECURE. Goldistock wristbands have a strong, waterproof, adhesive closure including tamper-resistant security cuts. This creates a greater level of security. When a person attempts to remove the wristband the scored material rips making it very difficult to transfer. SEQUENTIALLY NUMBERED. Sequentially numbered makes them ideal for crowd control and keeping track of attendance. EASY APPLICATION & ADJUSTABLE. One Size Fits All – 3/4″ Wide x 10″ Long. Adjustable to any size wrist. Wristbands come in sheets of 10. You get 50 sheets in all for a total of 500 wristbands. Every wristband has a different number on it making each one unique.